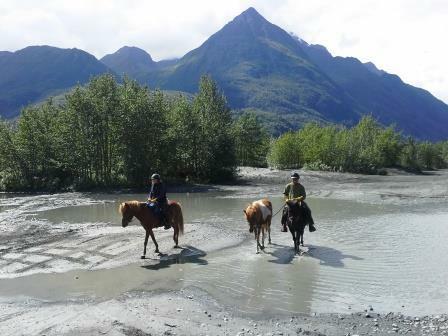 Yesterday we rode the Matanuska Lake/Crevasse Moraine trail system. And today we rode a portion of the Jim Creek trail system. Hard to believe that two trail systems, both within a 20 mile proximity of one another, would be so different. Pete and I did both rides with the Sihlers. And Vickie accompanied us on the first ride. The Matanuska Lake/Crevasse Moraine trail system is well maintained, and includes grassy fields and forested areas. The trails are level in parts, and have steep up and down portions in others. These trails are off limits to motorized users. There is a stretch, adjacent to the dump, where there are numerous plastic bags and some trash. Otherwise, these trails are litter free. There are some buggy areas, but not many. The area we were in is a part of the Greenbelt System. There are, in a few strategic locations, picnic tables, and at the Crevasse Moraine trail head, there is a horse hitching post and a sheltered picnic table area. How cool is that? We had just one encounter with a bicyclist – he came up behind me and spooked Raudi. But otherwise, there were no other user conflicts. The Jim Creek ride was another story. The trailhead was a mess – there was even a burnt out vehicle on site. The main trails were slick and rutted from ATV use. In fact, they were so bad that Raudi slipped onto her side. Don’t know how I hung on, but I did. Glass bottles and beer cans were everywhere, and I mean everywhere. It all reminded me of the movie Road Warrior – very post-apocalyptic. ATVers, motorcyclists, and dune buggy aficionados were everywhere. We stopped to eat lunch in what was a former campsite. It was totally trashed; however, no place else around was any cleaner. Someone left a broken trail chair. Frank sat down in it and fell to the ground. This was yet another instance in which the animals arose to occasion. At one point we came to a campsite with kids playing in the water. One in fact pointed his water gun at Raudi. I gave him a look that indicated that if he fired it that I would kill him – and I would have. And shortly thereafter we passed a slew of dune buggy racers. We could see the Knik Glacier at the distance. As I thought, the mob scene couldn’t take this away from us. None of the horses were fazed by anything. Hrimmi was the absolute best. She did not hesitate upon coming to creeks, puddles, or river crossings. Mr. T said to her “let’s go,” and this is what she did. It was a great way to continue this horses’ training. Seeing how well we all did ultimately made my day.